From an early age, retired Father Clifford Vogelsang has nurtured a love of history. “I think the first book I read was a child’s biography of Abraham Lincoln,” said Father Vogelsang, 76. But in the 50 years that he has lived and ministered as a priest, Father Vogelsang has more than just studied history—he’s been a part of it. He was ordained a priest on May 5, 1963—just months after the conclusion of the first session of the Second Vatican Council. In his first years as a priest, Father Vogelsang witnessed up close the years—at times exciting and at times tumultuous—during and immediately after the council. His love and knowledge of history, he said, helped him navigate through those often stormy years. 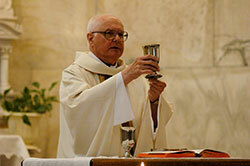 He grew up in the 1940s at St. Joan of Arc Parish in Indianapolis and said that its pastor at the time, Msgr. Clement Bosler, and associate pastor, Father William Morley, helped open his heart and mind to a priestly vocation. So did his parents. “They didn’t push it, but they encouraged it,” Father Vogelsang said. He entered Saint Meinrad Seminary in St. Meinrad in 1951 as a high school freshman. In the years leading up to Vatican II after Blessed John XXIII called for it in 1958, Father Vogelsang said that the seminary’s rector, Benedictine Father Theodore Heck, helped prepare him and his fellow seminarians for the historic council. For the first nine years after his ordination, Father Vogelsang was a history instructor at the former Latin School in Indianapolis, a high school seminary operated by the archdiocese from 1955-78. This love of history has helped Father Ginther in practical ways in leading the various parishes where he has ministered. Father Ginther also appreciates how Father Vogelsang did groundbreaking work in the 1970s and early 1980s in the three parishes that now make up the Richmond Catholic Community by helping them to combine their grade schools and other educational programs. Father Vogelsang said that the efforts he helped lead to combine the educational ministries of the Richmond parishes “laid the foundation” for the highly integrated manner in which the three faith communities today live out their entire mission. While he helped pave the way for changes in parish structures decades before they became commonplace, Father Vogelsang looks back with appreciation on the ministry he did one-on-one with individual parishioners in the various faith communities where he has been assigned. “You can see God’s grace at work in people and see people move along [closer to God],” he said. “You can also see people rejecting God’s grace. And that’s not so happy. Ann Northam is grateful for the 14 years that she ministered with Father Vogelsang at St. Augustine Parish in Jeffersonville. One particular memory of Father Vogelsang, though, still brings tears of gratitude to Northam’s eyes. When he retired in 2007, Father Vogelsang willingly took up part of that workload by frequently assisting in various parishes by celebrating Mass and hearing confession. “I think sacramentally I probably do more work now than I did as a pastor,” he said. He credits his own stubbornness as part of the reason why he remained a priest when so many others left ordained ministry. Despite the difficulties of the first years of his life and ministry as a priest, he sees good years ahead when considering the archdiocese’s seminarians. He looked to history when considering what words of encouragement he might share with men who are considering following in his footsteps as a priest.